Biomechanics is the field of podiatry which looks at the posture and movement of the foot to the relation of the body during standing still and during gait (walking). Many foot problems can be corrected by simple exercises or by the use of custom insoles or orthotics to help support the foot and reduce pain. 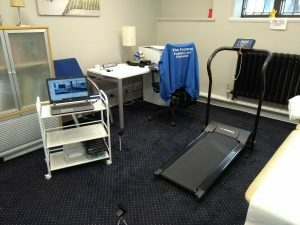 A biomechanical examination typically includes checking for a leg length difference, assessing the range of movement within the foot, ankle and lower limb, looking at the foot posture whilst static and video analysis of the patient walking / running. A common biomechanical problem found is over-pronation, or your foot rolled over on the inside arch of the foot. 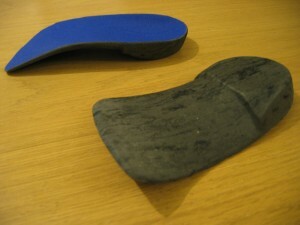 Custom orthotics or insole can be manufactured to help correct this problem. These are called 'functional orthotics'. Orthotics can be used for other problems as well, like deflecting pressure from areas of trauma or infection like corns or verrucas. These are called 'accommodative orthotics'. Sports Injury? How’s your golf swing. Orthotics are medical devices designed to fit inside your shoes to help improve foot mobility which has restricted movement due to a biomechanical dysfunction (functional). Alternatively they help protect the foot against excessive force building up corns or callus (accommodative). In a nut shell, they’ll help your foot move better or protect them against painful corns and hard skin. At Footman Podiatry, I keep a small stock or orthotics, normally covering shoe sizes 3 through to 10. As storage space is limited I cannot guarantee to have every size in, and may need to order. Where extra small sizes are needed - e.g. childrens, or extra large - 11+, these will be a special order and a fitting appointment will be required. 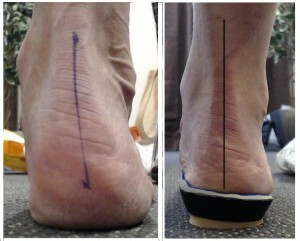 Full Length or 3/4 Length Orthotic? A full length orthotic can be used when the shoe has an insole which can be removed, and has the space / capacity to accommodate it. A typical example of this is an runner with fallen arches (flat feet), and suffering from knee pain. A full length, flexible insole with good arch support and a shock absorbing materials. A 3/4 length orthotic may be more suitable for use in a standard dress shoe (work shoe) where the insole is none removable and has limited space in toe box. 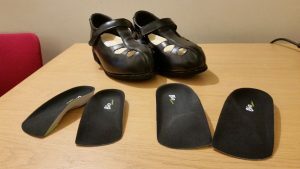 Materials for orthotics come is low, medium and high density foams, depending on the function of the insole and the weight / force pressing on it. 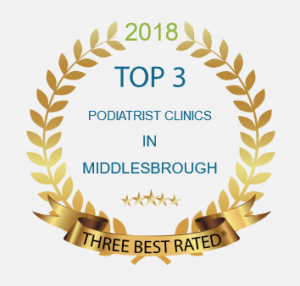 FootMan Podiatry can manufacture insoles in-house, supply a range of off-the-shelf insoles where required, or take imprints of your feet and have fully casted insoles made to fit your feet perfectly. Depending on the problem being addressed, insoles may only be required short term to aid recovery from over-use or sports injuries. 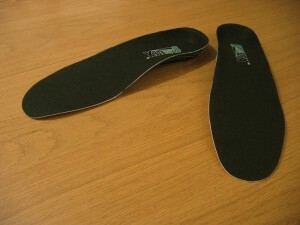 In other cases, such as leg length differences, insoles may be required for long term use. If you have problems with your feet which will benefit from orthotics, but your footwear cannot accommodate them, you can buy shoes which have the orthotic build into the shoe! At FootMan Podiatry, I have access to a good range of footwear which can provide the support your feet need! I can even arrange for fully made-to-measure footwear, even made in a soft leather suitable for diabetics. In short – no! People who will benefit from orthotics will usually suffer from some form of discomfort or pain to the feet, knees or even the lower back! Typical problems can include limited range of movement in the big toe, flat feet (pes planus) – which can result in medial knee pain, heel pain and leg length difference! This is not a definitive list – just a few basic examples. A very common problem I come across in clinic is a leg length difference in patients who have had a hip replacement. When the new joint is placed in the femur it can either extend or shorten the leg from a few mm, to an inch or more! This results in the hips being uneven and forcing a light curve to the lower back (lumbar curve). Over-time this can cause lower back-ache. A simple heel-raise for the shorter leg will correct this difference and help correct your back. For more information on hip replacements and back problems, read my blog.